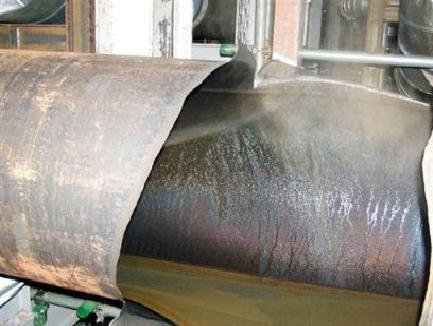 A piping rupture likely caused by flow accelerated corrosion and/or cavitation-erosion occurred at Mihama-3 at 3:28pm on August 9, 2004, killing four and injuring seven. One of the injured men later died, bringing the total to five fatalities. The rupture was in the condensate system, upstream of the feedwater pumps (diagram), similar to the Surry and Loviisa locations. Although the carbon steel pipe carried 300-degree steam at high pressure, it had not been inspected since the power plant opened in 1976. In April 2003, Nihon Arm, a maintenance subcontractor, informed Kansai Electric Power Co., the plant owner, that there could be a problem. Last November, the power company scheduled an ultrasound inspection for Aug. 14. On Monday, four days before the scheduled shutdown, superheated steam blew a 2-foot-wide hole in the pipe, fatally scalding four workmen and injuring five others seriously. The steam that escaped had not been in contact with the nuclear reactor, and no nuclear contamination has been reported. Initial measurements showed that the steam had corroded the pipe from .4 inches to .06 inches, less than one-third the minimum safety standard. 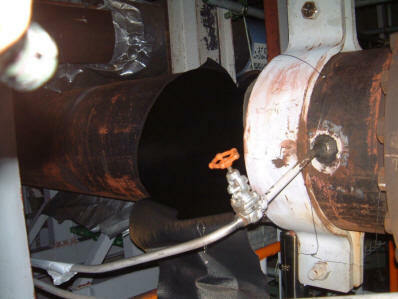 Kansai Electric said in a statement Tuesday that the pipe showed "large-scale corrosion." In response to the accident, Japan's Nuclear and Industry Safety Agency ordered four other power companies that own nuclear plants with the same type of pressurized water reactors to conduct ultrasound inspections of their pipes. 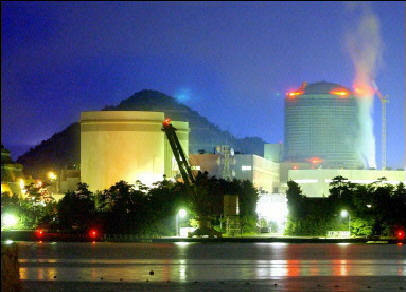 The inspections are to involve nearly half of the country's 52 nuclear power plants. The Kyodo news agency reported Wednesday that corrosion problems had prompted operators in recent years to replace the steam pipes at 16 plants of a design similar to that of the plant at Mihama. Japan has the world's third-largest nuclear power industry, after the United States and France. The government has planned to build 11 more reactors this decade, increasing the nation's reliance on home-based nuclear power to 40 percent of electricity needs. Already slowed by local opposition, this program may now be stalled by the accident, the most deadly in the history of nuclear power in Japan. "We must find the cause of the accident and urgently come up with measures to prevent such an accident from happening again," the newspaper editorialized. "This accident seriously damaged public confidence in nuclear safety and our nuclear measures." The Yomiuri, a conservative newspaper, warned: "Care must be taken not to overemphasize the dangers involved in the operation of nuclear power stations, which could lead to an overreaction. Operations at other nuclear power plants must not be undermined."